Today I Ate A Rainbow is an interactive nutritional chart that makes eating a rainbow of fruits and vegetables fun! Designed for children ages 3 and up, this product is made up of a colourful rainbow chart and bright coloured magnets that allow up to 4 children (or two children and their parents!) to easily track the fruits and vegetables they eat throughout the day. Also included are four achievement magnets and a rainbow colour-coded shopping list. Sometimes it can be challenging to get children to eat their fruits and vegetables – especially the 5 or more servings a day that is recommended. This chart provides a tangible and fun way for children to track their intake of fruits and vegetables. Fruits and vegetables contain vitamins, minerals and powerful phytonutrients. 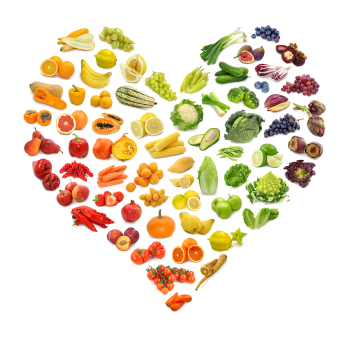 Many phytonutrients give fruit and vegetables their bright colour… the brighter the better! Our chart is made up of these major colour groups: Red, Orange, Yellow, Green and Blue-Purple. The different bright colours signify the different phytonutrients that each fruit or vegetable contains, therefore we use the Rainbow colours as a guide to getting a wide range of phytonutrients and nutrients in your children’s diet. Young children don’t need to know what specific nutrients each fruit or vegetable features: this chart makes it really easy for them – they just need to Eat a Rainbow every day! Red: Very heart healthy and gives strength support to our joints! Orange: A great source of Vitamin C. The orange group helps keep our eyes healthy! Yellow: This group is good for our skin and helps our digestive system! Green: Helps our entire body and strengthens our immune systems which means less colds! Purple: Purple/blue foods are excellent for our brains! They help us with our memory and also help keep some cancers away! Today I Ate A Rainbow is an award winning healthy eating game for kids created by parents that are passionate about creating tools to help other parents and caregivers raise healthy kids. Join our weekly healthy kids diet newsletter.